In his recent speech to Congress, President Trump included this pledge: “Every American child should be able to grow up in a safe community … and to have access to a high-paying job.” However, the main priorities for tax reform touted thus far—cutting corporate tax rates and providing tax relief for the middle class—offer little to help people living in economically distressed communities. Indeed, there are people in this country who will never see a single benefit from the cutting of taxes on corporations or people with middle incomes. This administration must not forget that “every American child” includes people living in places where the promise of new jobs based on corporate growth has been a myth for decades. “Every American child” includes people in between the two coasts, in mid-sized southern cities like Memphis, and in the tiny towns and hamlets of the Mississippi Delta and Appalachia, areas of this country with the highest concentrations of persistent poverty. Previous Republican and Democratic administrations and members of Congress have worked together to forge tax policy that advances the well-being of those who struggle economically. These tax policies included tax credits for corporations that invest in distressed areas that advance economic growth and prosperity, bringing much-needed capital into these communities for affordable housing, to start and expand businesses, and to upgrade essential infrastructure. the New Markets Tax Credit (NMTC) initiative, which—between 2003 and 2015— produced $42 billion in direct investments in businesses leveraging almost $80 billion in total capital investment in businesses and revitalization projects. In the absence of specific tax reform proposals from Trump’s economic team, Treasury Secretary Steven Mnuchin and others have pointed to the House Republican’s economic blueprint on taxes for clues on what Congress may pass. The blueprint calls for reducing the corporate tax rate from 35 to 20 percent. The uncertainty on tax reform has caused significant disruptions in the LIHTC market. Investors, believing corporate rates may go down, have begun discounting the value of the credits, which has the effect of slashing the number of housing units being built. Since 2005, HOPE-financed LIHTC developments have created housing for nearly 2,000 families, and we understand all too well the devastating impact this would have on the people we serve. Since November’s election, affordable housing projects have floundered across the nation as investor uncertainty on tax reform has immobilized one of the best means for attracting capital into impoverished places like the Delta. Even more problematic are rumblings about the possible elimination of LIHTC and NMTC altogether. The House Republican blueprint on taxes includes a tax simplification provision that aims to eliminate deductions and credits, decrying them as “pet projects of special interests.” Because the two programs are slightly different (for example, LIHTC tax benefits stretch over a decade, compared to seven years for NMTC), disruptions in NMTC markets have been less apparent. But the existential uncertainty is the same. 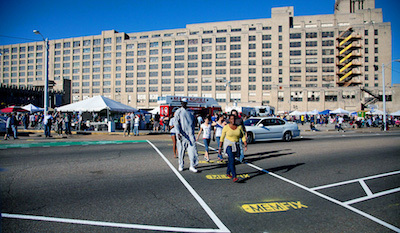 Loss of the NMTC would mean the end of creative, high-impact projects like Crosstown Concourse in Memphis, which is transforming a decaying 88-year old, 1,500,000-square foot, former Sears distribution center into a vibrant, mixed-use urban village. Several community development entities and investors, including Goldman Sachs, joined forces to use $56 million in New Markets Tax Credits to support the $200 million redevelopment, slated to open this summer. HOPE will operate a credit union branch in Crosstown, which will also house health clinics, a charter high school, commercial offices, and 265 loft-style apartments. As President Trump correctly asserts, the federal government does have a role to play in making sure the large corporations who drive the American economy also invest in making American communities work for every American child. But if we are to focus on America, as he demands, and make sure that every American child faces a brighter future, then the federal government must use all its tools, including tax policy, to create incentives that make life better for everyone. To this end, not only should tax credits be employed in this effort, but proven successes like the LIHTC and NMTC programs should grow, not be threatened. Great article, Bill. As a small business owner (www.torrancecarpetcleaners.com), I feel there is too much talk about corporate taxes for huge corporations, but not enough focus on small businesses. By default, LLCs (the majority of small businesses) are taxed at a higher rate due to social security and medicare, but large corporations that file as S-corp or C-corp get to kind of skirt around those taxes. I don’t think it’s right for LLCs and sole proprietors to be taxed more than corporations. Something should be done about that. What’s lowering corporate taxes going to do anyway? We’ve seen time and time again these large companies stuffing the pockets of their board members instead of reinvesting in more jobs, or god forbid, raises for their existing employees. Well said, Bill. Thank you for your leadership on this critical issue.